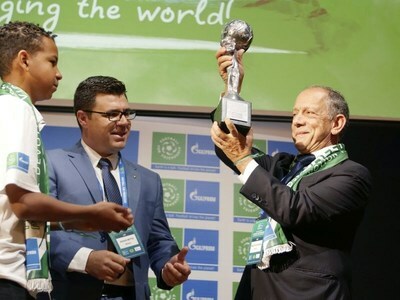 PORTO, Portugal, March 23, 2019 /PRNewswire/ -- Today, at Dragão stadium in Porto, the Young Ambassadors of Gazprom's International Children's Social programme "Football for Friendship" presented the main award of the programme – the Nine Values Cup – to the Brazilian national football team. This unique trophy symbolizes the Nine Values of the Football for Friendship – friendship, equality, fairness, health, peace, devotion, victory, traditions, and honour. The award ceremony took place on the threshold of a friendly match between Panama and Brazil. The following Young Ambassadors of the Football for Friendship have attended the award ceremony: Swan Drame (13 y.o., France), Catarina Barata (13 y.o., Portugal), Miguel Borges (19 y.o., Portugal), Denis Aladev (13 y.o., Russia). They told the Secretary General of the Brazilian national team Mr. Walter Feldman and the Manager of Technical Development and Social Responsibility of the Team Mr. Diogo Netto about the history and the meaning of this special trophy. Young Players and the Young Journalists from 211 countries and regions of the world took part in the open vote that has decided that the Brazilian national football team deserves the Nine Values Cup. Football for Friendship participants have acknowledged the Brazilian national team as the most socially responsible from 32 national football teams, which participated in 2018 FIFA World Cup Russia. The Brazilian national football team is the fifth winner of the Nine Values Cup. From 2015, the trophy has been presented to football teams of Barcelona (Spain), Bayern Munich (Germany), Al Wahda (Syria) and Real Madrid (Spain). This International Children's Social programme Football for Friendship has been implemented by Gazprom since 2013. The main values promoted by the programme's participants are friendship, equality, fairness, health, peace, devotion, victory, traditions, and honour. 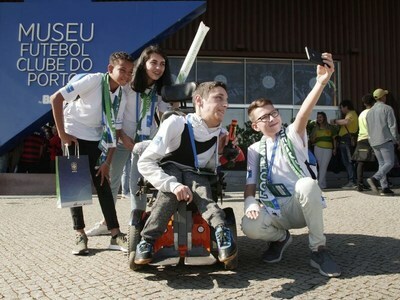 Its participants are Young Players (boys and girls including those with disabilities and special needs) and Young Journalists covering the events of Football for Friendship within the International Children's Press Centre. The final events of the Football for Friendship programme will take place in Madrid from May 28 to June 2, 2019. "The Nine Values Cup is a completely new, genuinely unusual trophy that is presented for the adherence to the values of the programme, such as fairness, devotion, and traditions. These are the milestones extremely close to everyone including both children and adults over the planet. This year, for the first time a team from Latin America was awarded the trophy – yet another proof that there are no borders for football and friendship!" commented Mr. Walter Feldman, General Secretary of the Brazil National Team. "I am very happy that the Football for Friendship programme gave me an opportunity to meet the members of the national team and even award them the Nine Values Cup in person! I think that one cannot become a successful person without following the universal human values. The more people in the world will discuss, and attract the attention to them, the better our life will become. The Nine Values Cup is a symbol of friendship, unity, and responsible attitude towards the society we live in for the children all around the world," says Catarina Barata, a Young Journalist of Football for Friendship.